Very pleased to announce that "STORIS: The Galloping Ghost of the Alaskan Coast" has been accepted for the Anchorage International Film Festival set for Dec. 4-13. This is an outstanding acknowledgement of the hard work invested in this project by Damon Stuebner and Rebecca Smith. The documentary is superb, as I have seen an advance copy and I know STORIS supporters will really enjoy it. Unfortunately, there is no ship left to honor in person, but with the memories of the crew and great works like the documentary, the legend of STORIS will live on. It's my understanding when last I spoke with Damon that production of DVD copies for limited distribution was coming soon. I'm sure Rebecca can chime in with details on that as they become more concrete. Here is the Coast Guard response to my FOIA Appeal. The response is dated August 31, 2015. This and other several projects have taken time to work through. It’s important to note that the original FOIA was submitted on Nov. 4, 2013, just after STORIS was exported illegally to Mexico for scrapping. My appeal was submitted on June 28, 2014. It was only after repeated inquiries all the way up to Commandant Paul Zukunft’s office that the CG finally responded. The CG’s official position is that they are sticking by the redactions of names for officials and officers associated with the disposal of STORIS. Despite my assertion that these are public employees and public officials who are being scrutinized for their role in the disposal of the ship (which has proven to be illegal on many levels), the Coast Guard maintains that releasing their names may lead to “unwanted invasions of privacy” from journalists and lawyers, so therefore the names are being withheld. This, despite some names being released in the original documentation up to the rank of RADM. It’s possible that some of these people have retired, but the redaction seems inconsistent across the documentation. This argument is flimsy as I was asking for names, not addresses, phone numbers or other specific personal information. Just names. Again, the process with STORIS was ILLEGAL. People VIOLATED FEDERAL LAW. The Coast Guard is also maintaining that the Office of Cutter Forces conducted a thorough search of records for STORIS and found nothing, so the CG legal staff is maintaining there is “nothing to see here.” Again, going back to my appeal this is a completely disingenuous response. I have been told by more than one CG officer familiar with cutter records – and I have no reason to doubt them – that the USCG, as a matter of routine standard operating procedure, purges records from the library at the Office of Cutter Forces when a cutter is decommissioned. When I made the request for records related to STORIS, the ship had been out of service for almost seven full years. If the records related to decommissioned cutters are removed from that location as a matter of SOP, why would the CG go looking for records there and then claim they found nothing? That’s like having your neighbor come to your front door to borrow a cup of flour, then you check your bedroom and return to the door to say with a straight face, “Sorry, I don’t have any flour.” You know you don’t keep flour in your bedroom but you do know where it’s kept in your house. So the Coast Guard knows where those records went – whether into an off-site archive somewhere else or they were discarded/destroyed as a matter of procedure but they instead want to stick to the story that there was nothing at Cutter Forces and therefore, no records to share. These records would have included maintenance records, Damage Control records, and other important documentation such as hazardous materials identification manifests and remediation reports. The only trace I can find of off-site documentation is for the ship’s drawings at the National Archives in College Park, MD. I would think with various litigation that goes on with veterans and exposure to various carcinogens and hazardous working environments that destruction of such records seems questionable. I’ve also heard from more than one CG veteran that cutter records are compiled and stored in other locations. And with STORIS, there would be no reason to destroy her records, as following her decommissioning, all the deck and engineering logs would have been compiled and sent off for review before being archived. This release does include several pages of documents that had been withheld from FOIA releases from other agencies, particularly the Maritime Administration. Some are fully released, others partially redacted. The Coast Guard maintains that it performed a thorough search for records and therefore, has fulfilled its obligation under FOIA. I disagree. Other FOIA releases from agencies like GSA and MARAD include correspondence with Coast Guard officials and CG documents for the ship. These correspondence streams and documents were not released to me by the CG, so therefore the search from the CG perspective is NOT complete as they failed to release that information. As one example, I have a copy of an email that discusses STORIS and her sale that involves Commandant Papp and several high-ranking flag officers including current Commandant Zukunft. I did not receive that from the Coast Guard, either. The last FOIA release from GSA also contained correspondence between GSA and Jeff Beach of the Coast Guard immediately following the GSA auction asking if the CG would take the bid of $70,100 for STORIS as an acceptable bid. That was a new twist as it has always been assumed that GSA officials made the unilateral decision on their own to sell the ship for the below-reserve bid. Now we find out that the Coast Guard and Jeff Beach had a say in that decision, yet there is nothing in any of the released correspondence from USCG that discusses that involvement. At this point, the CG considers this matter closed, referring any further correspondence or action to the Office of Government Information Services (OGIS) as a FOIA mediator through the National Archives. OGIS is toothless and cannot compel release of records, so that has no weight. I have kept the agency informed of the ongoing struggles with not only USCG, but MARAD, GSA and EPA, as well. I have received tepid responses from OGIS about their limitations. The only other recourse is to file a federal lawsuit to compel release of the records. This is not over, as I am currently weighing options and deciding in which direction to move. Overall, this has been a very disappointing exchange with the Coast Guard hierarchy. While many, many Coast Guard veterans have been overwhelmingly positive and a pleasure to deal with, the higher ranking officers and legal counsel with their CYA maneuvering have tarnished the level of respect for the service. STORIS deserved better and so did the men and women who served on her with Honor, Respect and Devotion to Duty. While the CG FOIA officials were liberal in their redaction, I did notice in a couple places that personal information for members of the public was left intact. In order to protect their privacy, I have had to go in and redact that myself, which has left the document chopped up into segments. 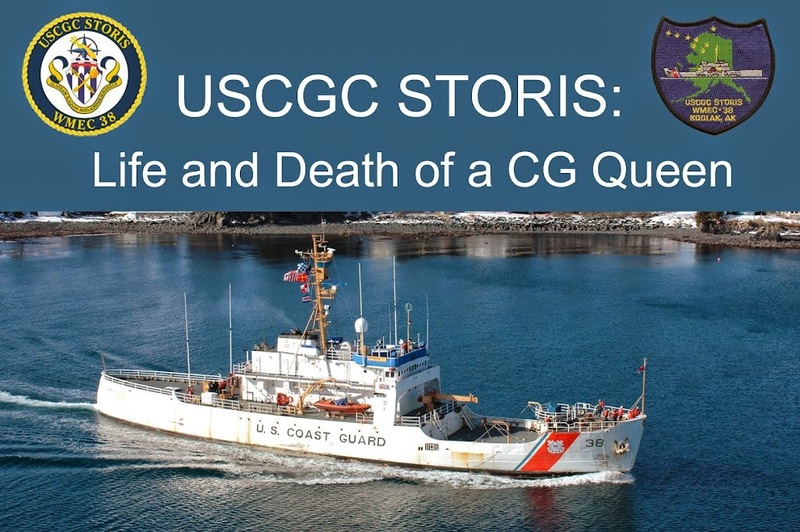 P 1 – The wholly inadequate cover letter used by the Coast Guard to claim that CGC STORIS was free of PCBs. The simplistic letter essentially admits that there are encapsulated PCBs aboard the ship. This document was the basis for GSA and EPA also claiming that the ship was completely free of ALL PCBs, even though EPA inspectors could have physically looked at the ship and determined that there was a significant quantity of highly suspect materials still on board that clearly had a high probability of containing PCBs. P 3- Correspondence regarding 12 linear feet of technical manuals that were removed from the ship. These memos start arrangements to return that documentation to the ship where it likely ended up in a Mexican trash bin. P 11 – Discussion between MARAD and CG related to the ship’s nomination to the National Register of Historic Places in 2012 and an inquiry from Jim Loback of the STORIS Museum. P 12-21 – Discussion regarding the storage and disposal of retired cutters, including the possibility of storing the decommissioned 378 CGC CHASE (WHEC-718) if the deal to transfer her to Nigeria fell through. P 22-23 Notification from CG to MARAD that STORIS has been sold and the desire to transfer title of IRIS and PLANETREE to MARAD to allow for their bundling into a scrap offer. P 25-33 – Correspondence between a contractor and Jeff Beach of CG from 2011 regarding a parts search aboard PLANETREE and IRIS for an oil filter housing to replace a damaged unit on GALLATIN. The contractors inadvertently boarded STORIS which, at that time, was protected as a vessel on museum hold status. P 39-41 – Discussion re the STORIS Museum acquiring the ship. The route of securing the ship through a state agency as federal surplus was never adequately explained to STORIS Museum officials, as confusion ultimately arose when the state and nonprofit claim periods were run together by GSA and GSA officials would make no exceptions or offer any further assistance to STORIS Museum once they found the MOA under Section 106 of the National Historic Preservation Act of 1966 that allowed the ship to be destroyed as long as she had a written history and photographic documentation performed through the Historic American Engineering Record. P 48-50 – Discussion among GSA, MARAD and CG (Beach) regarding removal of STORIS from the SBRF. Joe Pecoraro of MARAD states the ship cannot be moved by the July deadline set by GSA as MARAD’s schedule will not permit and the mooring arrangements for all ships in that row need to be adjusted to allow her removal. P 52- Arrangements for visit to STORIS by Jim Loback of the STORIS Museum and Damon Stuebner and Rebecca Smith for documentary production. P59- Discussion about the presence of oil in STORIS’ bilge, removal of the oil and the applicability/necessity for a Certificate of Financial Responsibility for oil pollution insurance. Also discussion about the necessity under California law to have a hull cleaning every five years. STORIS’ hull was last cleaned before she went into the SBRF in 2007. She was directly removed from the SBRF and moved to Mexico with no bottom cleaning after sitting in the moorings for over six years. P60-61- Information sheets from the California Marine Invasive Species program, as attachments to the discussion on P 59. P62- Request from Jeff Beach dated 11-30-2011 of CG to board and inspect PLANETREE, IRIS and STORIS for a material condition check. He asked to be accompanied by representatives of Allied Defense Recycling, the firm that ultimately became Mare Island Ship Yard (now Mare Island Ship Repair), then the only government-approved ship recycler on the West Coast.